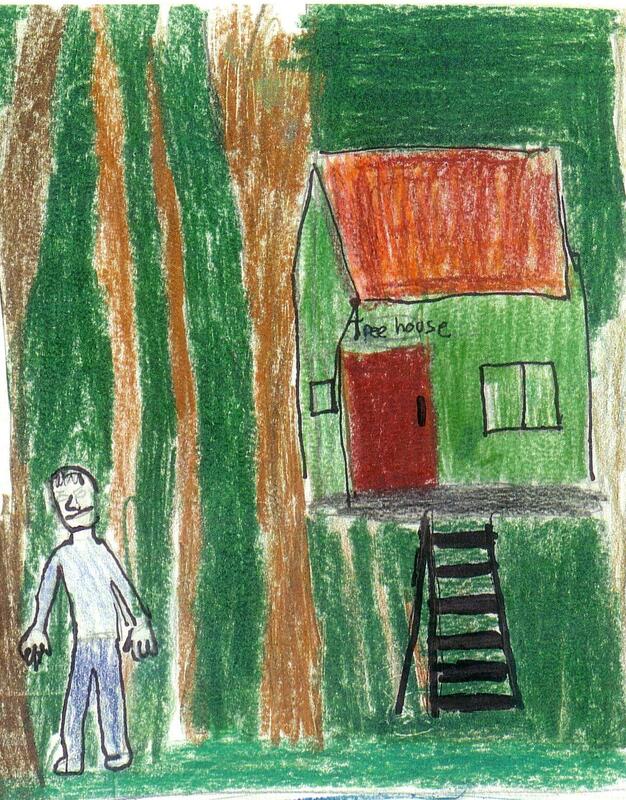 Last week, I focused on the book My Place, by Nadia Wheatley and Donna Rawlins, in which a series of child narrators describe the place where they live–always the same place, on the same hillside, changing as the book moves backward through Australian history. Each of the child narrators has his or her own sense of that same place. What builds a sense of place, for any of us? What do we even mean by that? What can adults do to give kids a sense of place–or to stay out of the way of their process of developing one? 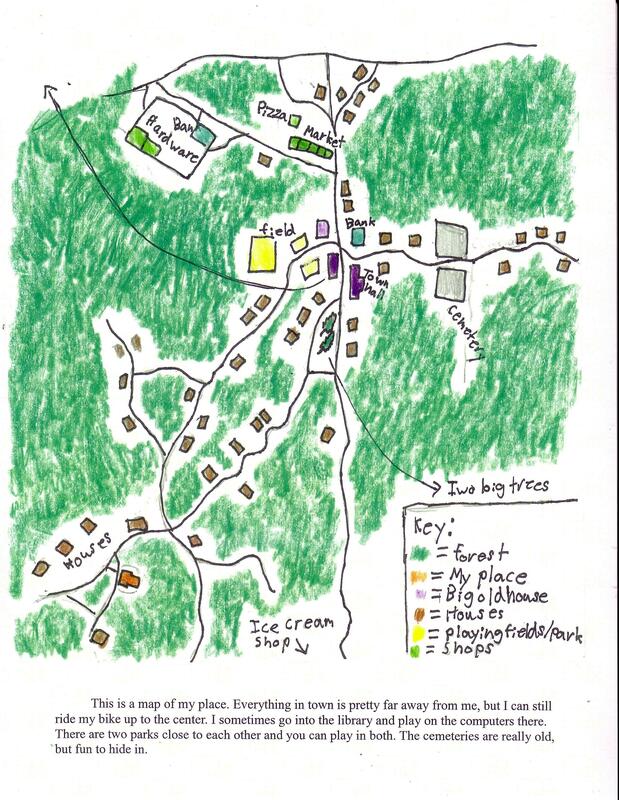 The book My Place inspired Our Places, a book created by one of my classes in the spring of 2010, when the kids with whom I had worked that year decided that they wanted to make their own maps of their own places, and put them together into a book. By “the same things”, the kids meant the motifs we had noticed in My Place, and then listed, common threads from child narrator to child narrator. 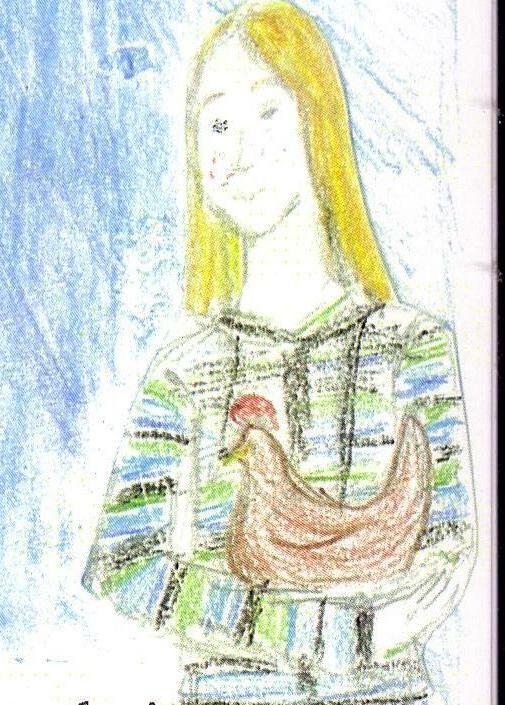 For example, in both books, My Place and Our Places, almost every child’s place includes a pet. 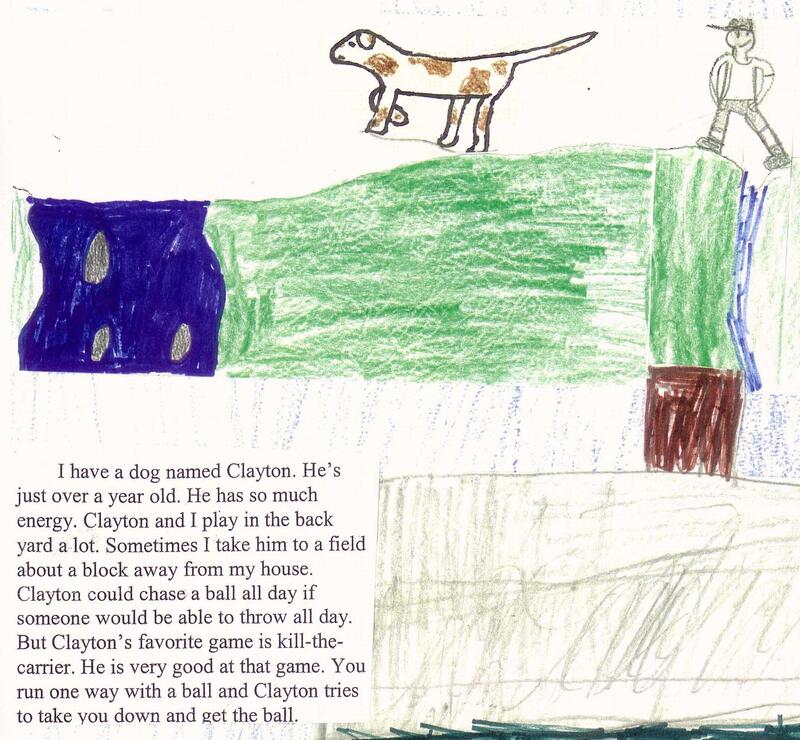 Jose wrote about his dog, Clayton. 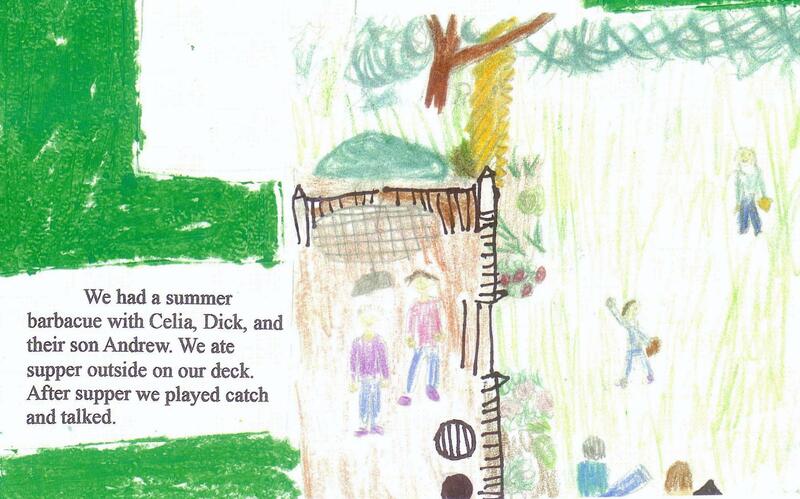 Other kids wrote about cats named Oliver, or Shelly, or Scout. One described a parakeet named Tweety. In both books, there’s always some kind of party. Luke lives in two separate houses with the two sides of his family. 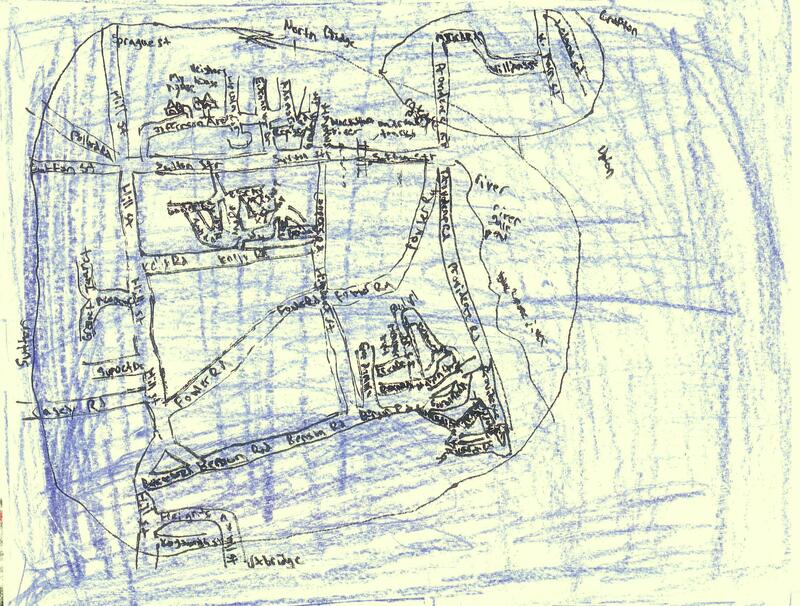 He decided to write about the place where he lives part of the week with his dad, in a section of Boston. 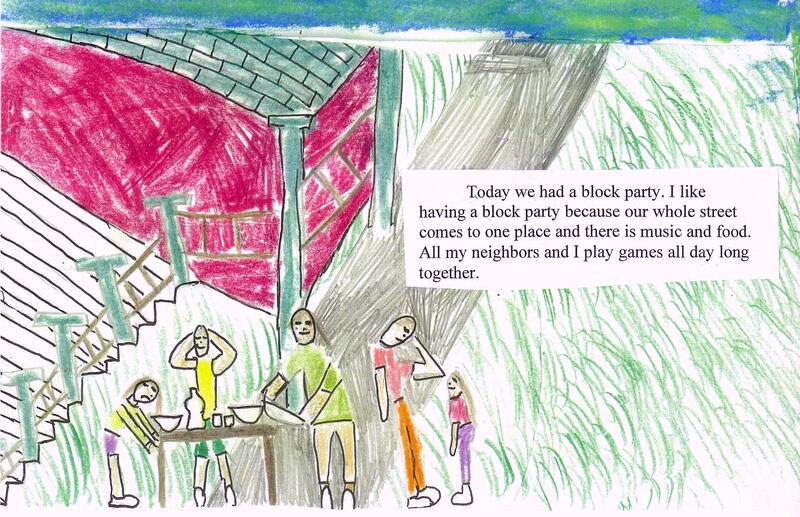 The detail below is from Caroline, who had already explained that her next-door neighbors were “almost like grandparents.” We didn’t coordinate which kinds of parties which kids would write about, but we wound up with an interesting variety: birthday parties, generic summer parties, a Halloween party, a Super-Bowl-watching party, a Fourth of July party with lots of fireworks, a Christmas party, and the gathering to send a big sister off to her prom. We talked about what the students could include that would be like the giant fig tree at the top of the hill in My Place, a landmark experienced and valued by every child narrator across a 200 year span. Should the students each focus on some natural feature? They settled on just something old: an old tavern, the stone walls along which chipmunks and squirrels run, an old car, cemeteries, a big rock. 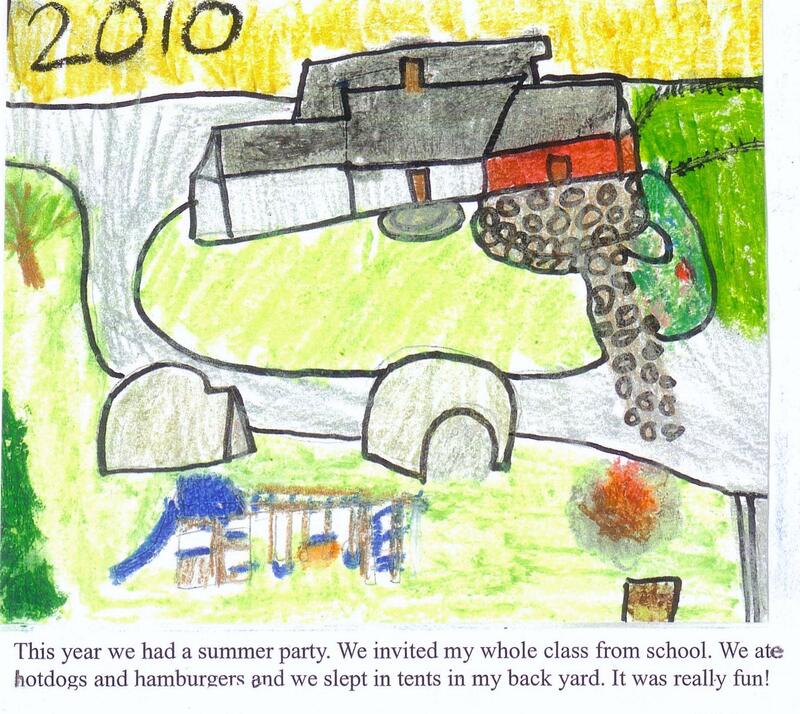 Growing up in a time when some kids are asked to check in with their parents by cell phone as often as every half hour, my students had been interested in the way the My Place kids roamed all over their neighborhood or hillside, with and without permission. Although we hadn’t chosen it as a common thread, several students wrote about their range of freedom, and how that had changed as they’d gotten older. Another girl marked in green the streets on her map where she was allowed to walk by herself. These were sketch maps, like the ones in My Place, made to scale as well as kids could manage, but not based on detailed measurements. (That would be another project.) 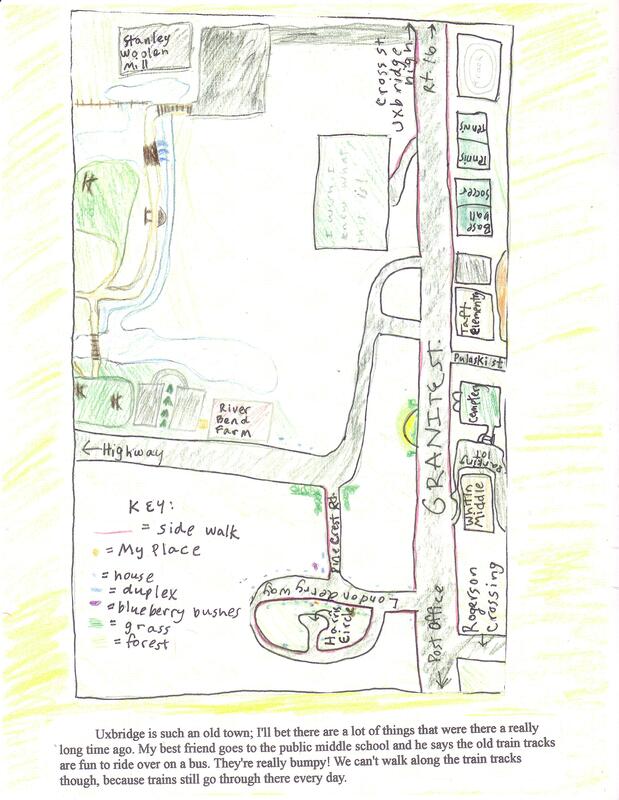 Here’s Abby’s map of her newly enlarged territory: Some kids made their maps more accurate with the help of published maps, by tracing or just looking at an existing map or aerial photo to get a sense of relationships. 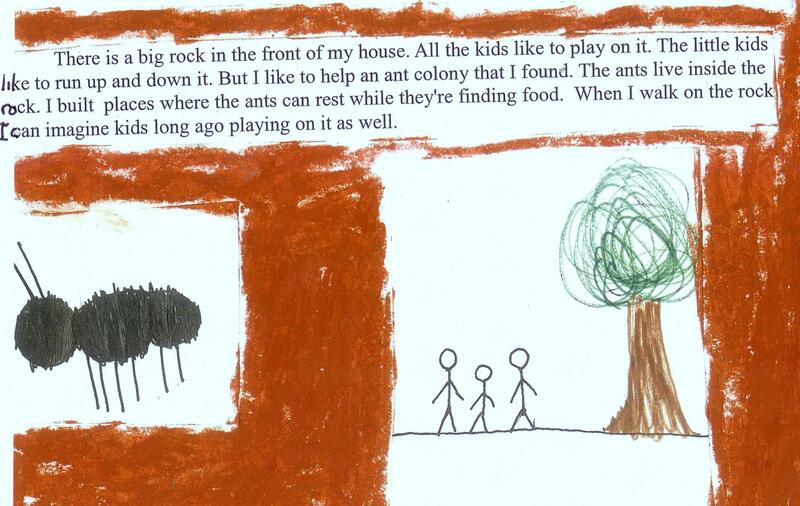 Like the maps in My Place, the student maps told parts of each child’s story. So what builds a sense of place? A sense of place can’t require staying put. In My Place, the final narrator, an aboriginal child, says, “I belong to this place,” instead of “This is my place.” But the place shown is just one of several places where that extended family stays for different parts of the year. What would it be like to stay in one place? Barangaroo’s grandmother says nobody would do that; it would be boring. For sure, though, Barangaroo has detailed knowledge and a strong emotional connection with that place. When I moved to the house and neighborhood I think of as “where I grew up”, I had already lived in seven previous places. Many of my students spoke in discussion about special summer places, or even, for one, a place she’d been only once, but memorably. I too had been strongly influenced by places where I’d never actually lived, including my Maine grandparents’ dairy farm, and my other grandmother’s urban lot in Brockton, Massachusetts, where I met the kids who lived on the street, and established hide-outs in the bushes. Who knows? The sense of contrast between a variety of places may focus a child’s attention on the uniqueness of each place. In any case, here’s what seems to be more important than duration: a child’s active experience of the place. To bond with a place, a child needs experience of that place within some kind of freedom to explore, to take risks, to know a range of emotions, to act on a sense of possession. To grow her own garden and decide what to plant in it; to build a treehouse with his uncle, or a dam across the creek, or to follow the path across the brook; to create a little secret get-away under a wisteria bush. Each experience becomes a tag, a label on the mental map the child is constantly creating, partly unconsciously. Each tag gets reviewed with revisits either physical or mental. Few kinds of learning more clearly deserve characterization as constructive learning, learning fitted together and made coherent by the learner; learning that constructs meaning instead of receiving it–in this case, meaning that is especially deep and nourishing. I’m struck by the importance of peers in this process of place-bonding: siblings, or neighborhood pals, or cousins, or even rambunctious dogs–fellow explorers, with their own impulses and their own hesitations, often useful. Time on one’s own matters also, and this is demonstrated in all my students’ equivalents of the hide-out in the My Place giant fig tree: their solitary bike rides, walks over to Dean Park, and charitable activities for ants. On the other hand, for anyone who thinks that young adolescents don’t care about grownups: notice the importance of both parents and other adults, the next door sort-of-grandparents, the almost adult who babysits, the neighbor who takes all the kids for a ride in his old car, while everyone squeals going around the corners. I loved how much I learned about each of these students, in the process of learning about their connections with their places. Teachers have to live with various kinds of grief, and one of them is this: it’s not possible to do every wonderful thing with every class. But I can’t help wishing I could have, and sometimes, in a group of adults, I have an almost irrepressible impulse to give them this assignment. When we agreed to make the book, I said I would figure out how to send a copy to Nadia Wheatley. It took several steps of contact, and involved some suspense. Eventually, that summer, a package came back from Wheatley with thanks warmly expressed, and with a wonderful surprise: a DVD of episodes from the video series made for Australian television in the year of the book’s twentieth anniversary, with extra episodes to carry the story to 2008, exploring new dimensions of belonging or not belonging. The video is wonderful, and does special justice to the book’s theme of transcending differences. Still, I feel as I often do about film adaptations of books I love: the book means more to me. It’s less about excitement, television style, and more purely about the role of place in our lives, the responsibilities a place can grow in us, and the ways sharing a place can connect us.